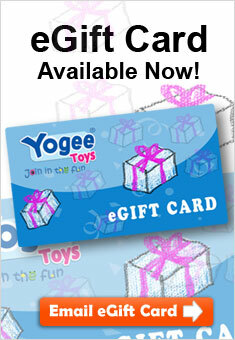 Yogee Toys makes it easy to find hundreds of toys and accessories for your growing infant! There plushy buddies and mats your littlest one can hold close, or shakers and characters to hang from your child’s playhouse gym. Great brands like Lamaze and Fisher-Price have playtime toys with buttons, sounds, and lights, or stacking and shape games for your child’s discovery. At story time, read to your little one from classics like Peter Rabbit, introduce them to texture with Usborne touchy-feely books, or let them cuddle with a soft book. Playtime is always fun with Yogee Toys’s great selection of toys!